The segways were so fun to ride that I missed some of the tour. They are much faster than I expected but definitely fun to ride once you get the hang of it. The tour guide was awesome, had a great personality and sense of humor and knew a lot about the city's history. Highly recommend. Thought there would be more instruction on the segways but we managed. Informed guide, nice stop for lovely ice creams and ride up the side of the Danube were especially enjoyable. 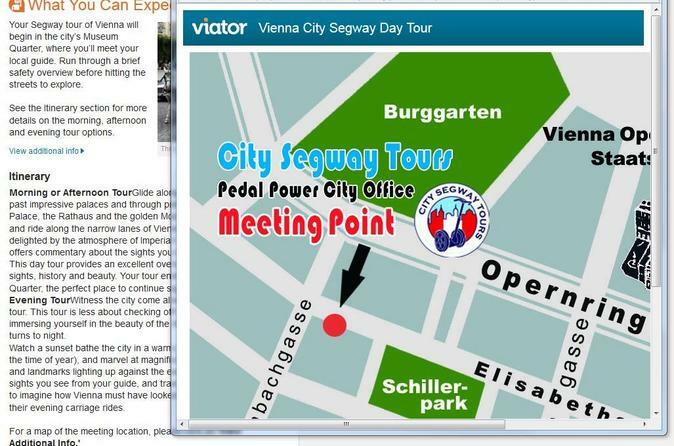 Ich stehe seit dieser Tour in Streit mit der Vienna City Card und Segway Pedal Power. Grund dafür ist, dass Pedal Power den versprochenen Rabatt für Inhaber von VCC in Höhe von 10 unberechtigterweise nicht zum Abzug brachte. Begründet wird dieses Vorgehen damit, dass ich die Buchung über Viator und nicht direkt über Pedal Power durchgeführt habe. Deshalb ist es mir wichtig hier und an dieser Stelle darauf hinzuweisen. Ich habe die österr. Konsumentenschutzorganisation gebeten mich in der Angelegenheit rechtlich zu unterstützen und fordere hiermit auch Viator auf dies zu tun. We enjoyed our tour guide but he was not very attentive to the group. He would zoom ahead of the group of us and some people were having trouble with their Segways. At least 5 people crashed on their Segways. We asked him to slow down and we don't think he really understood us. He kept saying that they all go the same speed. But, trying to catch up with him required us going as fast as we could which in turn caused the Segway's to push back on us since we were having to max-out the speed on them. This in turn pushed people off of their Segway's. One teen-aged girl crashed twice and was scared to get back on it. We did see plenty of beautiful things but were more worried about keeping up with our tour guide to enjoy the trip. Check out the alternatives before choosing this provider. They will charge your card an additional 400 euro as a damage indemnity. Unfriendly customer service as well. 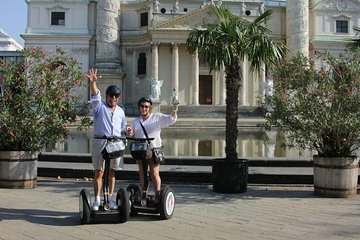 I've done several segway tours in Europe - all of them are amazing except this one. It's good enough but not great at all. I think we were just unlucky with our tour guide. Great way to get an overview of the city highlights and try some good ice cream! Good overview of the city. But wish they had a headset and you could get info as you ride around rather than making frequent stops and then hearing about places you passed by. The tour guy was informative and helpful, but really missed the real time info.